Rep. Erin Tañada, Rep. Neric Acosta, Atty. Eduardo Nachura, Rep. Ruffy Biazon and Dr. Norris Falguera listen as Rep. Noynoy Aquino answers questions on the impeachment process. 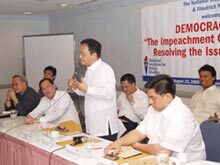 Given the political turmoil regarding President Gloria Macapagal-Arroyo’s legitimacy over allegations of cheating and lying, the National Institute for Policy Studies (NIPS) organized a Democracy Forum on the impeachment issue on August 23, 2005 in Quezon City. Entitled “The Impeachment Case: Imperatives of Resolving the Issue of Legitimacy,” the seminar outlined before a packed room the importance and implications of the impeachment process as well as explained the legality of it. The Friedrich Naumann Foundation (FNF) co-sponsored the educative event. Muntinlupa Representative Rozzano “Ruffy” Biazon stated that the impetus is to uphold the integrity of the presidency, to make the office more accountable and credible and to resolve the political crisis. 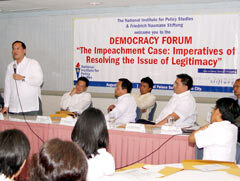 It is important that the procedure is followed in order to “strengthen the democratic process,” Biazon said. “It also sends a message that we do not tolerate transgressions, and that standards of good governance cannot be stretched provided there is a justification,” he added. “That was the failure of the old generation,” Biazon said referring to other officials who have cheated in the past. “It is time for the younger generation to initiate a stand,” he concluded. Quezon Province Representative Lorenzo “Erin” Tañada III addressed the legal issues surrounding the three impeachment complaints: Lozano’s, Lopez’s and the amended one. Tañada clarified that the Constitution prohibits the launching of more than one proceeding in a year. It does not prevent more than one complaint so long as these can be logically combined into one proceeding. Thus the Lopez and amended complaints are elaborations of the Lozano one. These were all submitted to the Justice Committee on the same day and are valid as they are the same proceeding.